the information of this post was copied from here. An exact accounting of the Donner Party is made difficult by deciding exactly when the Donner Party actually formed. The Party did not exist when its members crossed the Missouri River in May, 1846. George Donner was elected Captain of the Party at the Little Sandy River on July 20, 1846, but several people joined the Party later, at Fort Bridger and in the Wasatch Mountains. Four people left the Party to ride ahead for supplies: Charles Stanton, William McCutchen, James Reed and Walter Herron. One returned with supplies and was trapped–Charles Stanton–and he brought two more with him: Luis and Salvadore. Five people died before reaching the Sierra Nevada mountains: Luke Halloran, John Snyder Hardkoop, Wolfinger and William Pike. 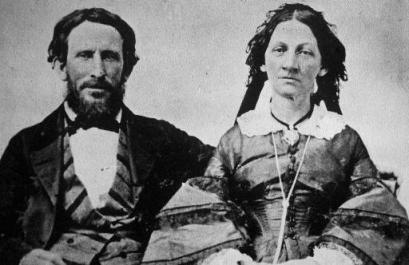 Of the 83 members of the Donner Party who were trapped in the mountains, only 45 survived to reach California. James Reed, who was the leader of the Donner Party in fact if not in name, arrived in California ahead of the Party, and mounted two rescue attempts. His wife and children remained with the Party, many of whom blamed Reed for their predicament. Yet, the Reeds were one of only two families to survive without loss. James Frazier Reed, 46, was banished after killing the Graves’ teamster John Snyder on October 5, 1846, at Pauta Pass (now Goldconda Summit, Nevada). He arrived safely at Sutter’s Fort, and attempted a rescue in November, 1846. After raising funds for, and leading the Second Relief, Reed settled his family in San Jose, where he farmed and was active in San Jose civic affairs. (Reed, Margaret, Virginia and Martha streets in downtown San Jose are named for the Reed family.) The Reeds had two more children. James Reed was the only adult survivor of the Donner Party to publish an extensive account, beginning with J. Merryman’s newspaper article based on Reed’s notes in the December 9, 1847 Illinois Journal, and Reed’s own article “The Snow-Bound, Starved Emigrants of 1846” published in the Pacific Rural Press in 1871. Reed died in 1874. His wife Margaret W. Reed, 32, was rescued by the First Relief. She died in 1861. Their daughter Martha (called Patty), 8, was rescued by her father’s Second Relief. She married Frank Lewis in 1856, and they had eight children. Son James Jr., 5, was rescued by the First Relief. In 1879 he married Sarah Adams in San Jose. They had no children, and James, Jr. died in 1901. Son Thomas, 3, was rescued by the Second Relief. He never married. Margaret’s daughter from a previous marriage, Virginia Backenstoe Reed, 13, was rescued by the First Relief. Shortly after her arrival at Johnson’s Ranch, she received a marriage proposal from Edward Pyle, Jr. She rejected the offer, and Pyle married Mary Graves. In May, 1847, Virginia wrote a first-hand account of the Donner Party in a letter that was published by the Illinois Journal in December, 1847. In 1850 Virginia married John Murphy and settled in San Jose. They had nine children In 1891 she wrote a more polished, but less accurate account of the Donner Party, “Across the Plains in the Donner Party” for Century Magazine. Margaret’s mother Sarah Keyes, 75, died on May 29, 1846 at Alcove Springs, near present Marysville, Kansas. The employees who accompanied the Reeds fared no better than the Donner employees. Servant, Eliza Williams, 25, was rescued by the First Relief. Six months after her rescue, she married. Eliza’s half-brother Baylis Williams, 24, died on December 15, 1846 at the Lake cabins. Teamster: Milford (Milt) Elliott, 28, died on February 9, 1847, at the Murphy cabin by the Lake. Teamster Walter Herron, 25, accompanied James Reed after Reed was banished by the Party on October 5, 1846. Herron was a day’s ride ahead with the Donners. Teamster James Smith, 25, died in mid-December at the Donner’s camp on Alder Creek. Friend Hiram Miller left the Reeds east of Fort Bernard, near present Douglas, Wyoming, on July 2, 1846 to accompany Edwin Bryant’s pack train. He joined Reed on the Second Relief, and carried out Thomas Reed. He then returned with Eddy and Foster on the Third Relief.